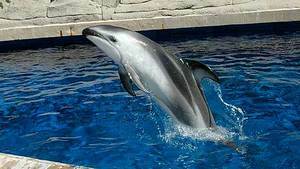 Spinnaker, the Vancouver Aquarium’s male Pacific white-sided dolphin, died on Wednesday, March 8, 2012. Spinnaker was rescued in 1991 after becoming accidentally caught in a fixed-location fishing net off the coast of Japan. He arrived at the Aquarium on July 31, 2001 at an estimated age of 14 years old. Spinnaker had been suffering from a prolonged illness, and was under close observation for several months. He was under the care and treatment of the Aquarium’s veterinarian, Dr. Martin Haulena. The Aquarium says Spinnaker appeared to be doing better in recent weeks. Spinnaker was taken to the provincial Animal Health Centre, where Dr. Haulena will conduct a full necropsy today. Preliminary results are expected on Friday, March 9. Spinnaker was one of three dolphins at the Vancouver Aquarium. The remaining two are Hana, a 14-year-old female and Helen, a 21-year-old female. In 2009, 31-year-old Laverne died at the Aquarium. Tiqa, a beluga whale, died from pneumonia in 2011.